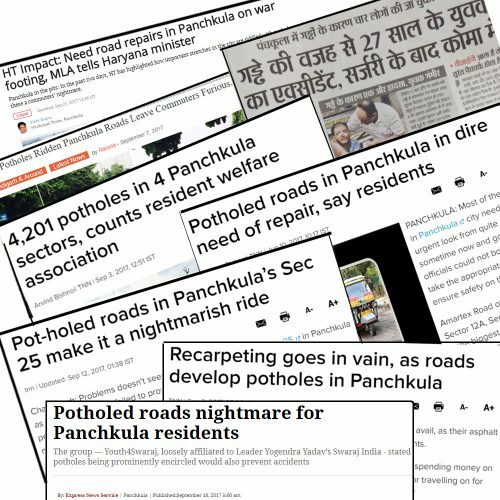 If you’ve been to Panchkula recently, you must have noticed deep potholes on the roads outlined with white powder, with all kinds of faces made around them, slogans like ‘Pride of Panchkula’ written around them. It’s the people protest towards negligent and apathetic attitude of MC Panchkula towards providing basic amenities to people, the roads; concrete, levelled and safe roads. White highlighted potholes on Panchkula Roads tell embarrassing tale of MC failure. Panchkula residents have come up with the most imaginative way to embarrass MC Panchkula with their week-long protest, मेरा गड्ढा, मेरा गौरव (My Pothole, My Pride). Started on September 17 by Swaraj Abhiyaan Panchkua, the zealous team of 15-16 people, highlight the potholes chuna (slaked lime). In last 5 days, the team has covered more than half of Panchkula. Early in the morning around 7 am, these people throng an area and start painting the roads white. Sometimes, the joggers and early morning walkers join them and numbers reach upto 50. Talking to ChandigarhX, Shalini Malviya, the member of Swaraj Abhiyaan’s National Working Commitee’s member and mentor at Youth for Swaraj, said that मेरा गड्ढा, मेरा गौरव is our way of conveying to the administration that we accept these potholes that they have offered us. They neither lament or abuse any administrative official. They are not going to sit on a dharna or bhookh hartal, they will silently keep on beautifying these potholes around the city. Sharing the rationale behind this protest, she said that the administration is completely apathetic to our pain. Daily accidents of Panchkula roads are reported and innocent lives are killed in many cases, but the administration has unapologetically turned blind eye to this and busy in their political tussle and blame-game. In their rift, it is the citizens who are suffering. The protest in the most non-aggressive way aims to wake them from their slumber and knock the conscience of the citizens to stop complaining sitting in their cosy rooms, rather raise your voice and ask questions. Tomorrow September 23 is the last day of the protest officially when they plan to beautify the pride of Panchkula, the Amartex Road around Industrial Area. मेरा गड्ढा, मेरा गौरव has also initiated a contest, मेरा गड्ढा, सबसे बड़ा (My Pothole, The Largest). ♦ Here, citizens are invited to send the pictures of the potholes with their name, Location and approximate dimensions of the pothole to 9999993544 via whatsapp by September 23. ♦ The winner will be honoured on Sunday, September 24, 5 pm, at Yavnika gardens in Sector 5, Panchkula by the Panchkula Mayor (whom Swaraj Abhiyaan Panchkula is inviting to grace the occasion). Shalini Malviya said that this is a citizen’s protest. They will not drag people to Yavnika on Sunday to flaunt the great turnup or support to the movement. Anyone who realises his/her democratic rights to make the administration answerable and responsible can come. An ambitious boy, about to finish his high school, Pranay aims to make big in his life. He is a voracious reader and especially fond of reading biographies. He draws inspiration from legends like Muhammad Ali. He is an ace basketball player. When not in basketball court or reading, he can be found either with music or in company of his dog, Rusty.